How to calculate the debt to equity ratio? How to calculate stockholders' equity? Debt to equity calculator helps you calculate the debt to equity ratio, otherwise known as the D/E ratio. This metric weighs the overall debt against the stockholders' equity and indicates the level of risk in financing your company. This article will explain some basic terms and calculation methods such as the debt to equity ratio formula and stockholders' equity equation. Additionally, we will demonstrate how to calculate the debt to equity ratio basing on an easy-to-follow example. You can also take a look at other leverage ratios, for example the debt to asset ratio (especially useful for companies) or debt to income ratio (interesting for personal finance purposes). The D/E ratio illustrates the proportion between debt and equity in a given company. 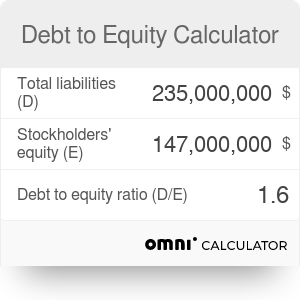 In other words, the debt to equity ratio shows how much debt relative to stockholders' equity is used to finance the company's assets. Analyzing the debt to equity ratio lets us notice some essential aspects of the condition of your business, as well as the operating style. If the D/E ratio is high, the company uses leverage extensively; it means that they decide to fund their operations mostly by debt, which is typically associated with high levels of risk. Naturally, high leverage ratio has its benefits. Companies with a high D/E ratio can generate more earnings and grow faster than they would without this additional source of funds. However, if the cost of debt (interest on financing) turns out to be higher than the returns, the situation can become unstable and lead, in extreme cases, to bankruptcy. A lower debt to equity ratio means that investors (stockholders) fund more of the company's assets than creditors (e.g., bank loans) do. It is usually preferred by prospective investors because a low D/E ratio usually indicates a financially stable, well-performing business. Determining whether a debt to equity ratio is high or low can be tricky, as it heavily depends on the industry. In some industries that are capital-intensive, such as oil and gas, a "normal" D/E ratio can be as high as 2.0, whereas other sectors would consider 0.7 as an extremely high leverage ratio. Total liabilities - a sum of short-term debt, long-term debt, and other financial obligations. Stockholders' equity - representing the book value of the company, this metric can be found by subtracting liabilities from the sum of a company's assets. This ratio is typically shown as a number, for instance, 1.5 or 0.65. If you want to express it as a percentage, all you need to do is multiply the result by 100%. As you can see, company A has a high D/E ratio, what implies an aggressive and risky funding style. Company B is more financially stable, but cannot reach the same levels of ROE (return on equity) as company A in the case of success. Debt to Equity Calculator can be embedded on your website to enrich the content you wrote and make it easier for your visitors to understand your message.